Children just love to have fun! 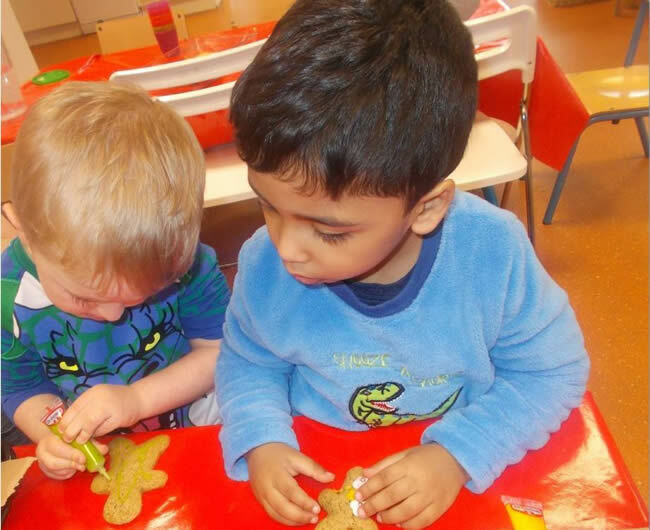 Park Academy Childcare’s pre-school camps run throughout the summer and have an exciting new theme each week. Our themes cover a wide variety of activities so there will be lots to interest everybody! From sports to superheroes, cowgirls to ‘Come Dine with Me’, we can guarantee that your child’s day will be packed with fun and stimulation. The only issue may be convincing them to come home! You can book your child in for the whole summer or on a weekly basis and there are both full and part time camp options available. Camps also include chef prepared meals/snacks AND a weekly trip on our ‘Adventure Bus’! See our sample summer camp themes below. For more information contact our enquiries team. Superhero camp will transport your child to a special realm where their imaginations will know no bounds! Children will get to create their very own superhero complete with unique powers and an original superhero costume. They will design a comic book with their superhero’s story, make superhero crafts, play superman tag and complete a super hero obstacle course. There will even be a special food tasting for superheroes to help them fuel their superpowers! Finally a superhero party will celebrate an all-round ‘super-duper’ week. Children will enjoy a week of beach themed activities from designing their very own surfboard to a limbo and hula hoop contest. Participants will really look the part in their handmade grass skirts and leis and will create beautiful seashell jewellery as souvenirs! They will also enjoy creating healthy watermelon slushies and OJ lollies to keep everybody cool. There will be lots of fun active challenges including a water balloon toss, beach themed relay and a lollipop boat race. A lovely luau will provide the perfect ending to the ultimate Hawaiian experience! Calling out an SOS – Save Our Smarties! During this week children will learn the basic survival skills – while also having lots of fun! Participants will take part in team bonding activities, make a survival kit, get camouflage face paint, and build a camp fire. The group will also pitch their tents in the garden for a spot of outdoor camping. Our special ‘I’m a Smartie Get Me out Here’ series will involve various survival tasks as well as a ‘gross eating challenge’ to disgust and delight! All survivors will then be treated to a cosy camp party where they will sing songs and eat marshmallows… from the comfort of their sleeping bags! JUMP for joy – JUMP camp is back! Campers will experience a different sport each day from dodgeball tournaments to relays and various ball games. All activities are led by our JUMP Sports Coordinator Eamonn who just loves to see children getting fit and having fun! Other activities will include football golf, water sports and traditional schoolyard games. All activities encompass hand/eye coordination, balance, agility and movement – key skills for early development in sport. Camp highlights will include an obstacle course and a special sports day event! This week’s camp will be wild….we’re going to the Wild Wild West! Our mini cowboys and cowgirls will be transported to the Wild West through various activities such as teddy lasso competitions, making cowboy and Indian costumes, singing cowboy songs on the range, and creating sheriff’s ‘wanted’ posters. They will also go panning for gold and do a bit of line dancing! The highlight of the week will be the ‘Yee-haw Hoedown’ which will give everyone a chance to show off their new moves! Giddy up! Our camp participants will enjoy their very own ‘Come Dine with Me’ experience this week as they have lots of fun with food! There will be blindfolded food tasting, mystery food games, and fun food art! Children will also get to plant their own herbs and vegetables, learn how to set a table and create a menu for a special manager’s meal. Our group will then get to emulate our chefs as they prepare a delicious breakfast, lunch and dinner especially for their manager. It’s going to be a fun ‘jam’ packed week! Join us for Animal Planet Camp…it’s out of this world! This camp will take children on a journey with creatures great and small, whether it’s going on a bear hunt or playing animal charades. There will be lots of animal art and crafts from creating creature costumes to making collages of our pets. Children will investigate animal footprints, have fun with an animal piñata and get the opportunity to relax with an animal themed movie. They will also get to practice their communication skills through animal information presentations. An animal disco will allow the children to go wild to some animal themed tunes! Best of the Best Camp! It’s time for the children to choose…and do whatever they loved best! From the most popular art & craft activities to choosing their favourite costume for dress up day, children will get a chance to enjoy all of their favourite summer camp experiences…once again! Campers will also have the opportunity to reflect on their personal highlights from summer camp and create a scrap book of their special memories. They will create an illustrated story board of their favourite trip and compile a recipe book of their favourite healthy meals. Everyone will be involved in creating a time capsule and leaders will organise a special pen pal club to keep all new friends in touch. An end of summer party will be the ‘best’ fun and will wrap up our summer camp season in style! Discount provided on block bookings. To find your nearest centre see our list of locations here.